It is hard to believe that it has been over 16 years since the Statler Brothers announced their retirement; however when they retired they really meant it. Since 2003 Don Reid has written some books, co-authoring one book with older brother Harold Reid but little else has been heard from Harold and virtually nothing from Phil Balsley. The fourth Statler, Jimmy Fortune was ten years younger than Don Reid and fifteen years younger than Harold Reid and Phil Balsley, so he chose to pursue a solo career. Fortune still performs today, sometimes in conjunction with Dailey & Vincent or other bluegrass acts. We take country music groups for granted as there have been many successful such acts over the years, with the Oak Ridge Boys, Exile, Restless Heart, Shenandoah, Alabama, Sawyer Brown, Old Dominion and other acts following in the Statler Brothers’ footsteps. While there had been vocal groups before the Statler Brothers, those groups had either been cowboy groups such as The Sons of The Pioneers, The Oklahoma Wranglers (a/k/a The Willis Brothers) and Foy Willing and the Riders of the Purple Sage, or else gospel groups such as the Chuck Wagon Gang, The Blackwood Brothers or The Oak Ridge Quartet (from which sprang the Oak Ridge Boys). Indeed, even the Statler Brothers started out as a gospel group using the name the Kingsmen, changing their name when a west coast group had a hit with a song titled “Louie, Louie”. During this period the group consisted of the Don Reid(lead vocals), Harold Reid (bass vocals), Phil Balsley (harmony vocals) and Lew DeWitt (high tenor vocals). Although the Don usually sang lead vocals, on many songs each member would sing lead on a verse. Because of his unique soaring high tenor, sometimes Lew DeWitt would be the lead on a song. By that time, the Statler Brothers had already become associated with Johnny Cash and were no longer performing strictly as a gospel group, experimenting with secular music, often novelties. They would remain on the road with Cash from 1963 to 1971 and were signed to Cash’s label Columbia Records from 1964-1969. In 1965 the group scored its biggest ever hit with DeWitt’s “Flowers on the Wall,” which went #2 country / #4 pop was a huge seller internationally and won a Grammy. Subsequent singles for Columbia did not reach that level of success although novelties “Ruthless” and “You Can’t Have Your Kate and Edith, Too” both reached the top ten. The Statlers signed to Mercury in 1970, find their sound and milieu almost immediately, aided by expert production by Jerry Kennedy, who had helped resurrect the career of Jerry Lee Lewis. Tapping into America’s longing for more peaceable times, the Statler Brothers embarked on a series of albums, dealing with nostalgia in its many forms, while also embracing more modern themes and occasionally some gospel music. 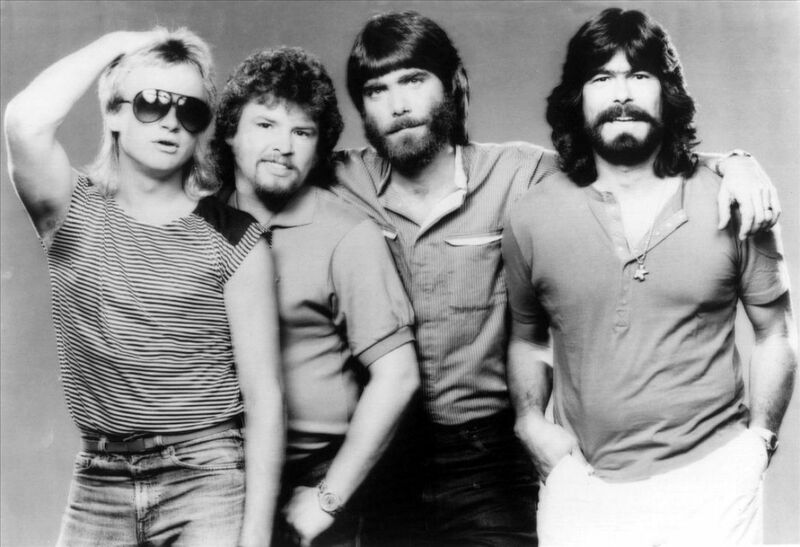 Although the group wrote much of its own material, they also used outside material, both new and old, both country and pop in their quest for quality material. From 1970 through 1982 the group charted 36 singles, 17 of which made the top ten (8 into the top five) and another 10 of which reached the top twenty. In 1983 Lew DeWitt dropped out of the group after battling Crohn’s disease for many years. DeWitt had been missed a number of dates in 1982 and had spotted Jimmy Fortune as a worthy replacement. When DeWitt dropped out, Fortune slid easily into the group. DeWitt had a brief remission from Crohn’s and pursued a solo career but the remission was brief and by 1990 DeWitt had passed away from complications of the disease. The substitution of Fortune into the lineup added an additional quality songwriter and provided a brief upsurge in the group’s fortunes. While the group had consistently been near the top of the charts only “Do You Know You Are My Sunshine” had reached #1 for the Statlers while DeWitt was in the group. The group would have three more #1 singles, all on songs penned by Fortune (“Elizabeth”, “My Only Love”, and “Too Much On My Heart” but after 1985, radio increasingly turned to younger acts – the last top ten record would be “More Than A Name On The Wall” (about a mother visiting the Vietnam War Memorial to see her son’s name). Although radio lost interest, The Nashville Network (TNN) did not, and the group hosted a television series for 1991-1998. Although the show’s ratings remained high throughout, new ownership really had no interest in country music and discarded most of TNN’s programming. The Statler Brothers were the first vocal group to have sustained success in country music (I should note that the Oak Ridge Boys pre-date the Statler Brothers, but they remained a gospel group until 1977). While modern-day country acts seem unaware of the Statler Brothers, their influence on bluegrass has been strong, with Dailey & Vincent being strong proponents of their music and always including several Statler songs in live performance. The Statler Brothers were probably the first country music act to transfer the genre’s tendency toward nostalgia from a rural to a suburban setting. Kurt Vonnegut referred to them as “America’s Poets”. Moreover, the group stayed together unlike many groups which seemed to have a revolving door of group members. Vinyl records were the format in which recordings for the Lew Dewitt years were issue. The material on Columbia is pleasant, but the group was still finding its way. I have all of the Mercury albums featuring Lew DeWitt and I regard all of them as priceless treasures. Unfortunately, most of the CDs featuring DeWitt are anthologies that also include the Jimmy Fortune years. The Statler Brothers website does have a four-CD set featuring the group’s first eight albums on Mercury – it sells for $49.95. It is a little pricey but if all you have heard is the radio hits, this is a great place to examine the depth and breadth of the group’s talent. Actually, I could make the same comment about the Jimmy Fortune years – mostly it is anthologies that are available, but because Jimmy’s entire tenure with the group falls into the digital era, used CDs can be found with a little effort. I will say that the albums of the Jimmy Fortune period tend to be less interesting as albums, although the singles remained strong. I would stay away from the Farewell Concert album which sounds very rushed as if the boys couldn’t wait for the show to be over. The Statlers continued to issue some recordings after their tenure with Mercury (later Polygram) was over. Some of these recordings can be found on their website. Good News Travels Fast is the first new Shenandoah album in a decade and the first since Marty Raybon rejoined the band as lead singer. Billed as a Gospel album, it is more accurately described as a religious or Christian album. There are no traditional hymns or old Gospel favorites; the album is collection of eleven new, mostly solid tunes, a few of which have a traditional Gospel sound, a few more are more pop and rock flavored, but most are country-sounding (or what country used to sound like) songs with religious or inspirational themes, in the vein of “Sunday in the South” and “Mama Knows”. The excellent bluegrass-tinged title track is the album’s first single. I’m not sure if it’s being marketed to country radio, where it is unlikely to garner much attention, but it may bet some airplay on Christian radio stations. The first verse, about a former hellraiser who finds salvation is reminiscent of Dallas Frazier’s classic “The Baptism of Jesse Taylor”, while the second and third verses deal with the birth and resurrection of Christ. “Didn’t It Rain” and “Sunday Morning Sermon” are in a traditional Gospel style. Both sound like something that might be sung at an old-style revival meeting and both are excellent. On the opposite end of the spectrum are the album’s two weakest tracks – “Hallelujah for the Cross” which is a little more contemporary Christian in style, and “If I’m Right”, which takes issue with those who look down on believers, is a little too rock-leaning for my tastes. The remaining tracks sound like what we’ve come to expect from Shenandoah. “I Know He Knows” is a nice acoustic number about a father and son relationship, which also serves as a metaphor for the relationship between God and man. “Just Wait, Be Still” is another excellent acoustic tune. Marty Raybon wrote this one with Jerry Smalley and bandmate Mike McGuire. Raybon and McGuire also wrote, along with Mark Narmore, “A Cross Between a Sinner and a Saint”, the album’s opening track. The first verse deals with the protagonist’s struggles to walk the straight and narrow. Midway through the song, however it switches course and talks about the two criminals who were crucified alongside Christ. In this verse the “saint” is the criminal who repents and the “sinner” is the one who still does not believe, and Jesus is on the cross between a sinner and a saint. The analogy doesn’t quite work, however, because clearly among that trio, it is Jesus, not the repentant criminal, who is the saint. But that is probably nitpicking at what is an otherwise good song. There aren’t any huge surprises here; Shenandoah fans are bound to enjoy this album unless they dislike religious themed music. I wasn’t in the best of moods when I started listening to it but found I was feeling better by the time it finished playing. In that respect, at least, the album accomplishes its goal. The new six-track EP Christmas Comes Alive marks the first time in 18 years that Marty Raybon and Shenandoah have recorded together. Coincidentally, their last album together was also a Christmas collection. Christmas Comes Alive consists of mostly new material — some of which they wanted to include on their 1996 album, but Capitol insisted on an album of Christmas classics. After a lengthy delay, the original material has finally seen the light of day. The EP’s opening track is “Mary Had a Little Lamb”, which was written by drummer Mike McGuire, who produced the EP with Marty Raybon. It starts out as the familiar children’s nursery rhyme, but it quickly establishes that the little lamb’s name was Jesus. It’s followed by the title track, written by Marty Raybon, Bud McGuire, and Kim Williams. An upbeat number about Santa’s elves preparing for the big day, it is one of the songs that the group had wanted to include on their Christmas album for Capitol. “Good Ole Fashioned Christmas” and “Family Tree” both revisit familiar themes of family, tradition and traveling home for Christmas. Both are good, if not particularly memorable. The album’s standout track is the closing number “Lullabies In Bethelehem”, a Mike McGuire co-write with Mark Narmore that tells the story of Nativity from the point of view of another traveler to Bethlehem, who took the last room at the inn and would have gladly given it up had he known how desperately it was needed by Mary and Joseph. The collections sole traditional tune is a very nice rendition of “The First Noel” which fits in very nicely with the newer tunes. There are no Johnny Mathis or Nat King Cole style songs here. No strings or orchestras, just plenty of fiddle, dobro and banjo, the kind of country sound one expects from Shenandoah. In addition to Christmas Comes Alive, Marty Raybon and Shenandoah are reportedly working on more new music, which is expected to be released next year. If it is as good as this collection, then 2015 is already starting to look like a good year for country music. Rarely is a stint as the lead singer of a successful band a good launching pad for a solo career; just ask Larry Stewart, Paulette Carlson, or any of the countless others who tried and failed. Marty Raybon is no exception. Although the Raybon Brothers enjoyed some modest success with the sales of “Butterfly Kisses”, Marty’s hitmaking days ended shortly before he left Shenandoah. He resumed his solo career when the Raybon Brothers disbanded. None of his solo efforts was released by a major label. One of his better efforts is 2006’s When The Sand Runs Out, a mostly acoustic effort that is part country and part bluegrass with the occasional bit of gospel thrown in. The listener is immediately reeled in with the opening track “Looking For Suzanne”, the story of an absentee father seeking to be reunited with his now adult daughter. The parent-child relationship is examined again from a different angle later in the album with Michael A. Curtis’ “Who Are You”, which examines the lifelong relationship between a father and son, from the son’s birth, through the rebellious adolescent and teenage years, to the role reversals when the son becomes the caretaker for the now-ailing father who can no longer recognize him. Both are excellent songs that were way too serious for 21st century country radio to even consider touching with a ten-foot pole. The upbeat “Shenandoah Saturday Night”, another Curtis composition co-written with Marty and Mike Pyle, is the closest this album gets to a commercial song. It pays homage to Marty’s days with Shenandoah and name checks many of the hits he scored during his dozen years as the band’s lead singer. The non-charting “Shenandoah Saturday Night” was the album’s only single. It leads into a highly enjoyable cover of Bob Dylan’s “You Ain’t Going Nowhere”, that might have been my favorite track on the album had I never heard the Roger McGuinn and Chris Hillman version that appeared on The Nitty Gritty Dirt Band’s Will The Circle Be Unbroken, Volume 2. The McGuinn/Hillman recording was the first version I ever heard and it remains my favorite. The highlights of the album are the beautiful ballad “I Know Love”, which Marty wrote with his brother Tim, and “Come Early Morning”, which was written by the great Bob McDill. I also particularly enjoyed the album’s bluegrass numbers “Throw Dirt” and “Wish I’d Never”. These came as a bit of a surprise, since I’d never thought of Marty as a bluegrass artist. Admittedly, I’m not terribly familiar with his non-Shenandoah work, so I don’t know if he dabbled in bluegrass prior to this, but he proves that he is more than capable of pulling it off credibly. When The Sand Runs Out is an album clearly not made with an eye on the charts. It is sparsely produced and sounds as though it may have been a live-in-the-studio recording as opposed to the usual practice of recording different tracks separately and assembling them later — just a guess on my part. This gives it a decidedly non-commercial feel, which coupled with first-rate material, only adds to the album’s appeal. After leaving Shenandoah, Marty decided to team up in a duo with his brother Tim. MCA released their one and only album together, a self-titled effort, in 1997. Even Marty Raybon’s committed soulful vocal can’t save the gooey sentiment of ‘Butterfly Kisses’, the duo’s first single. The song had been a big AC hit for its writer, Bob Carlisle, but the Raybon Brothers’ country cover was less successful with radio, just creeping into the top 40. It may not have helped that another rival country cut was around at the same time (by Jeff Carson), although that one performed even more poorly; and the original itself also got some country airplay. However the exposure did propel the single to high sales figures, and it achieved gold certification. ‘The Way She’s Lookin’’ is a bouncy up-tempo number which while fairly generic is much more enjoyable. Unfortunately, it was a bit of a flop when it was released as the second single; a shame, as it deserved to do better than ‘Butterfly Kisses’. The final attempt at a single was a real misstep. ‘Falling’ is a very boring and not terribly good AC-styled duet with Olivia Newton-John – a curious choice whose shortlived country career was long since over. It didn’t chart at all, and didn’t deserve to. Also great is the Don Cook/Al Anderson penned ‘Trying To Keep The Woman I’ve Got’, a charming, up-tempo polite rejection of a woman coming on to him in a bar. This is like vintage Shenadoah. ‘Baby Blue’ is an average song, but has a pleasant melody and some lovely close sibling harmonies. The brothers wrote ‘Your Love’ with Mike Curtis, and this is quite a good sunny up-tempo number reminiscent of Shenandoah. Tim was allowed to sing lead on a few tracks. He shows himself a competent vocalist with a big meaty voice, but not in his brother’s class. His vocal on ‘Gettin’ Ready For The World To End’ is loud and unsubtle, while he gives a solid but somewhat anonymous performance on his own ‘Hello Love’, which is quite a nice song. ‘Tangled Up In Love’ is a limp pop number co-written by Keith Urban. The brothers’ musical partnership having failed to set the charts on fire, the duo disbanded, and Marty turned to a solo career. there are enough bright spots to make this worth picking up if you can find it cheaply. Change was in the air for Shenandoah as the 90s rolled to their mid-point. Liberty, the label upon which they released In The Vicinity of the Heart, had a name change back to Capitol Records Nashville. Marty Raybon released a solo gospel project in November 1995, and the band contributed “Can’t Buy Me Love” to Come Together: America Salutes The Beatles that same year. Stan Thorn and Ralph Ezell, two of Shenandoah’s founding members, exited the group around this same time as well. Amidst the upheaval they were able to deliver a new album, with the band now a trio. Now and Then, a record consisting of five new songs and eight re-recordings of their biggest hits for Columbia, dropped in 1996 with Don Cook producing once again. Album opener “All Over But The Shoutin,’” a rockilin’ honky-tonker was the first and only single, peaking at #46. The production on the track is listenable, but Raybon’s rapid-fire lyrical delivery is awful and leaves the track without room to breathe. “Lonely Too Long” isn’t much better with a dated line dance-esque sound and cliché ‘country boy meets city girl’ lyrics. “Nowhere To Go But Back” hardly reverses the trend, serving up more nondistinctive dreck. “I Got You,” with it’s fiddle heavy production sounds like it came from a completely different album. Raybon sings with his trademark-relaxed twang here, and it’s a nice change of pace. The only ballad among the new tracks, “Deeper Than That” is okay, but suffers from a rudimentary lyric and bland production. The rest of Then and Now, except for inclusion of “Somewhere In The Vicinity of the Heart,” which closes the album, consists of the aforementioned re-recordings. I’m not a fan of this practice at all, especially in the age of digital downloads where the re-recording is often the only available version of a song. I understand why artists do it, so their songs are available again, but it’s still an annoyingly cheap ploy to scam the fans that don’t know any better. I don’t think I’d mind this practice as much if the songs were nicely updated, but they’re just cheap carbon copies of the originals. Only “Mama Knows” actually sounds good. The others, particularly “Two Dozen Roses” and “Sunday In The South” lack the magic of the originals. As a whole, Now and Then is a weak, weak album deficient in quality songs with tasteful arrangements. As the final album for the band in its semi-original form (they formally disbanded in 1997) it’s a shame their ten-year career closed on such a sour note. With all the hits they gave us in their prime, they and their fans deserved so much better than weak re-recordings and mailed in original tunes. Download “I Got You” and leave the rest in the dust. You’ll be better for it.